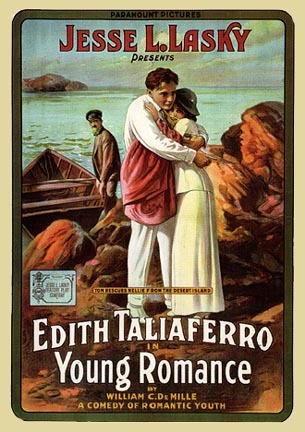 Early romantic comedy directed by William C. DeMille and Cecil B. DeMille (even though the IMDb credits someone else). A poor girl (Edith Taliaferrpo) and poor boy (Florence Dagmar) work at the same department store but don’t know one another. They’ve both got a week’s vacation coming up and both decide to pretend to be rich in hopes of finding someone rich to marry them. They both end up at the same resort and eventually hook up with both thinking the other is rich. The biggest problem with this film is that, like most romantic comedies of today, the thing is just way too predictable but the star’s charm keeps things going. The best scene is when the two go on a date at an expensive restaurant and the waiter keeps order the most expensive stuff on the menu not knowing the guy is poor and won’t be able to pay for it.